We need to go away more often. It’s amazing what happens when we leave the country. We currently have a simple/organic church that meets in our home. It’s actually run by our daughter and son-in-law. We turn up from time to time. For most of September and part of October, Tony and I were in Russia and the UK. Shortly after we left, a young man named Jose (aged 15) turned up at the gathering–schoolfriend of two nieces of Roxie who is part of the church. Jose is a sweet, incredibly loving, guy with a great sense of humor and a real love for the Lord. Jose had one thing on his heart. His prayer was speedily answered. The very next week his mom, Rosaura, came with him. Rosaura had many needs. She had major problems with both drugs and alcohol. The group spent most of their time together that week praying for her. She surrendered her life to Jesus and was completely delivered–no substance abuse since then. The following week the group didn’t meet for various reasons but Rosaura was anxious that her sister, who has also had problems with alcoholism, get prayed for too. So Roxie opened up her home and the sister was set free too. Roxie has had a weekly get-together in her home since then. Two weeks ago we were back in the country. That week, during our time together, Rosaura’s sister gave her heart to the Lord. 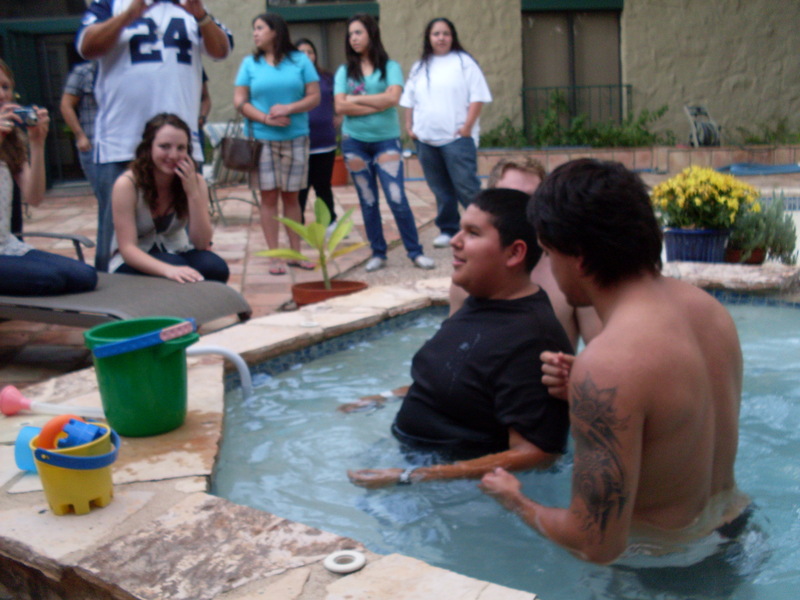 Jose’s simple faith led to his mother and aunt finding Jesus. Last week, the family turned up with some devastating news. Apparently Jose had been having increasing problems with headaches and deteriorating vision. He saw an eye doctor early last week. Several urgent specialist visits later, he was diagnosed with a large, infiltrating tumor pressing on his optic nerve and pituitary gland. He is scheduled for the 8-hour surgery tomorrow. Full recovery of both nerves and his endocrine system is expected to take more than a year. As yet, there is no way to know if the tumor is malignant or benign. Rosaura is standing firm in her new-found faith. The morning Jose was due to see the neurosurgeon, she asked the Lord, “Please show me something from your word.” She opened her Bible randomly to Mark 1 and put her finger down on verses 30-34–the story of Jesus healing not just Peter’s mother-in-law but also many other sick or demon-possessed people. She knows that Jesus is working in her son’s life. Two days ago, we had a phone call from Roxie. 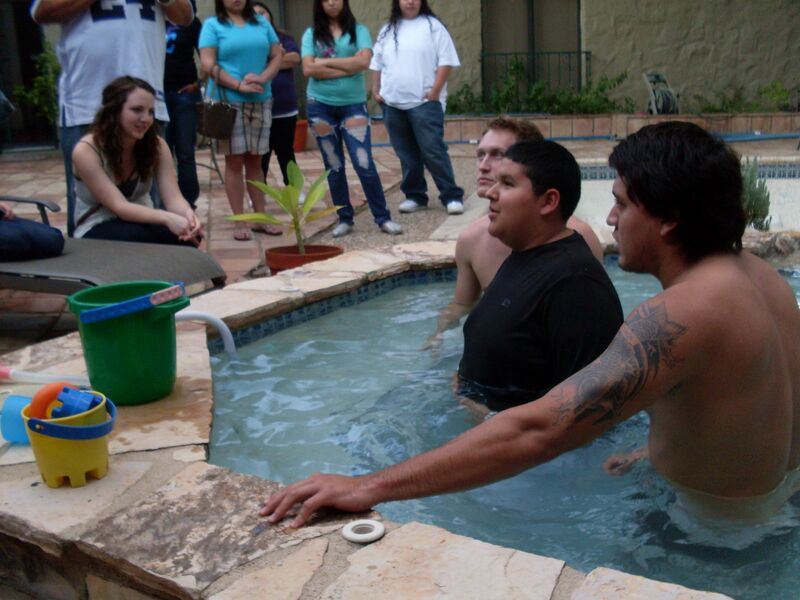 So yesterday evening, around 40 people gathered around our hot tub as Jose and Rosaura were gloriously baptized. Many of their family members and friends were there, several having come into town to support Jose and Rosaura through the ordeal of major surgery. So here’s our urgent request: obviously we have prayed for Jesus to heal Jose, but his surgery is scheduled for 10 am tomorrow morning. Rosaura has given permission for us to tell her story and to enlist others in the battle for Jose’s life and health. Please pray that if the tumor is still there, it is easily removed without complications, and that Jose makes a full recovery with no residual effects. And it would be wonderful if you would get others to pray too. Many thanks–and if the Lord reveals anything to you as you pray, let us know. Lord Jesus, You have called this young man to lead many to you. Heal him completely without delay so he may declare your goodness. Praying…thanks to all for sharing. • We ask that every resource of heaven would be dispatched at this time to thwart every strategy the enemy has against Jose and that those strategies would be reduced to rubble. • We are trusting you to bring healing for the specific purpose of glorifying Jesus and extending your kingdom. • We pray this with the “signet” vested in us by your word and praise you for your faithfulness to your word. Thank you all for praying. Jose is in surgery right now. We will know more this evening. Beth, I have sent on the verse the Lord gave you to Rosaura and Roxie. Any word on Jose yet? Thanks for asking about Jose. He required a second surgery because of infection at the beginning of this month, and had a recent scare when his eyesight started deteriorating so he was back in the hospital this past weekend, but, praise God, that all turned out to be nothing and he went back to school for the first time yesterday. Yay! At a spiritual level he’s doing great, and so is Rosaura who has now been totally off drugs and alcohol for more than four months. She is a radiant testimony to the grace of God.